Sadly, Microsoft Security Essentials and I have had a falling out. We’re through – it’s over – that’s it. It’s broken the cardinal rule I’ve long established for all my applications – trust that it will perform as advertised. It’s been replaced in my affection by another – one that lives up to its billing – AVG AntiVirus Free 2013. Microsoft Security Essentials no longer does. Frankly, I’ve avoided AVG’s products for years – with good cause I think. Applications that are slow, cumbersome, updates that crash systems ….. have a way of ending up in file 13 (the garbage), around here. In the past, AVG’s products were known for all of that, and more. It had its defenders of course, but I was not one of them. As MSE has slowly lost its touch, AVG has bounded ahead. It’s sleek; it’s fast; it’s free – and, in the latest AV-Test.org’s (see AV-Test.org’s full results here), it pummels MSE – again. In fact, for the second testing cycle in a row – Microsoft Security Essentials has failed certification as an effective security application. 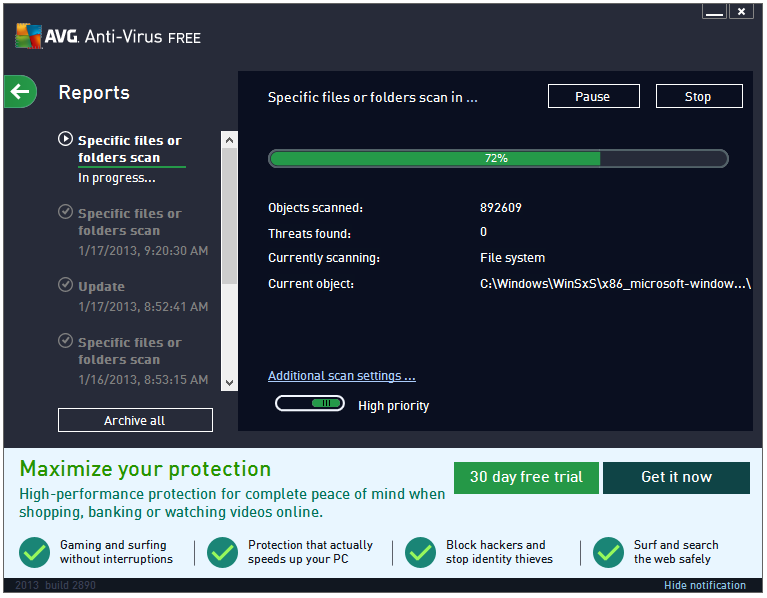 Quick overview of AVG AntiVirus Free’s salient score points. Click graphic to expand. I’ve been running with AVG AntiVirus Free 2013 on a primary home system (a Windows 8 machine), since September 5, of last year. The verdict? I’m impressed – very impressed. 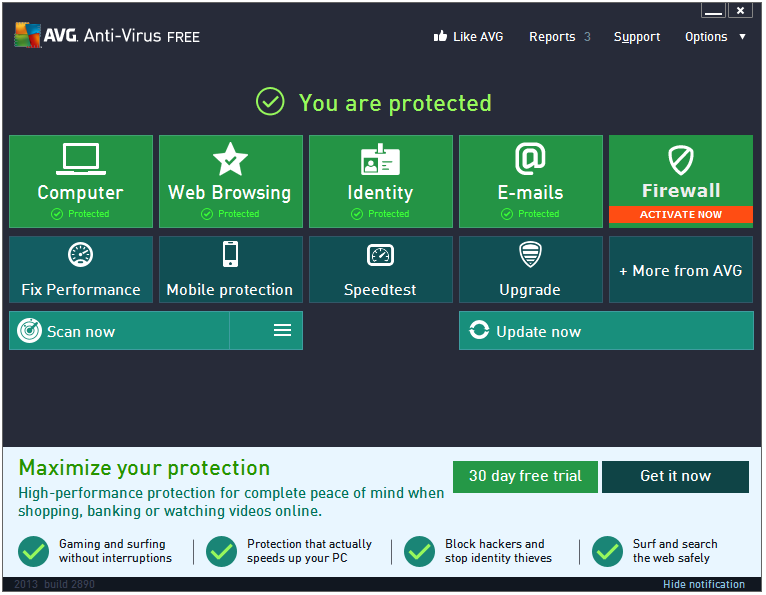 As you can see from the following screen shot, AVG AntiVirus Free offers substantial protection – not quite up to the standard of the company’s paid applications – but, more than enough (in my view), that an aware user should feel comfortable. Keep in mind, that an educated user understands the limitations of relying on a single security application and, is conversant with the principal of layered security. Windows 8 users will notice that the GUI (as shown below) owes a little something to Windows 8’s Metro (or whatever MS is calling it these days) GUI. Multiple choices are available in the settings menu so that users can tweak and massage the application to meet their specific needs. I must admit – that was a major positive for me. Running a scan: As is my practice – I run a complete scan on my machine’s boot drive every day. And a full scan on all attached drives, weekly. 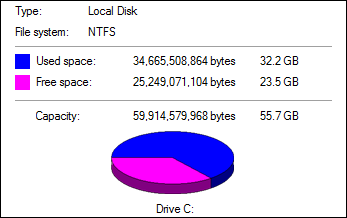 Running a scan: 60 GB SSD – particulars as shown below. Scanning time – just under 5 minutes with “High Priority” set. Slip in a USB device – and…. System requirements: Windows 8, Windows 7, Windows Vista, Windows XP. It’s not just the software that’s free. So too is phone access to our team of support experts 24/7, 365 days a year (USA, UK, Canada). Kudos to AVG!! 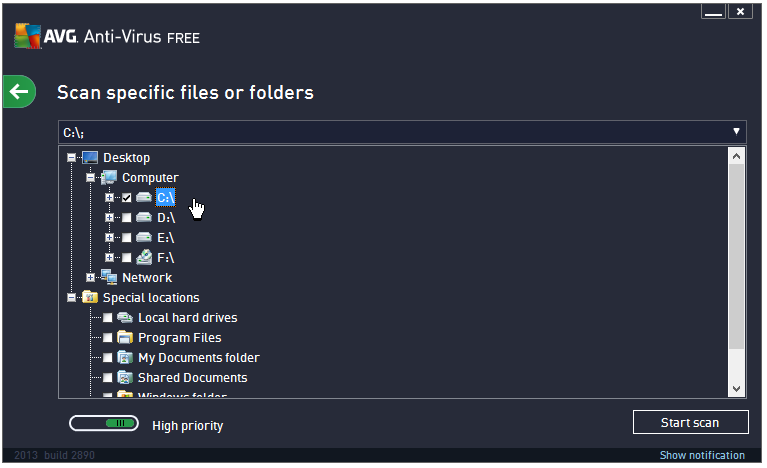 You’ll notice a basket-full of additional free AVG products on the download page – you just might find something that fills a gap in your overall security plan. Whether you’re an experienced user, or you consider yourself “average”, I recommend that you spend some time scouting around the application’s GUI – there’s lots to be discovered here. All of it good. Thanks for the review but I’ll stick with the free version of avast! I hear ya loud and clear. avast! is a superior application. Switching over to a new AV is such a pain. I am more than disappointed in MS.
I’m convinced.. it’s always good to have options Bill. As a user of MSE myself I’m disappointed by this, but very grateful to you for pointing out its shortcomings. I’ll certainly be giving AVG Antivirus Free a whirl, then I’ll have to eat humble pie for recommending MSE to my daughter for her new laptop. Such is the nature of software. The only constant is? Now I love the “change” word – but, not when it’s applied to my AV apps. Microsoft seems to have become rather complacent with respect to MSE (Windows Defender in Win 8) – more than surprising given the chaos we face everyday on the Internet. Thanks for the linkback Rick. You are very welcome! I woke up this morning, saw your article, that prompted me to write mine. I’m going for AVG! When I first found your site I was using AVG and had multiple false positives. You really helped me during that crisis, and advised I use MSE. As I’ve said the fact is that these winners come and go, and what may be best at one time might be a poor choice today. What I do need to make clear is that I have dial-up and not high speed. For example, with pictures off, it takes over 2 minutes to load your website. So in the past I noted that AVG used large updates. Whereas, as you stated to me at the time, MSE had smaller updates by comparison, and that has proven true over these nearly 3 years now. How can MS not do anything about this? I’ve read here previously, as you have alluded to, that they failed last year. I said, at the time, that they would get cracking, but apparently not. So my question to you, Bill, is would it be OK to continue with MSE, hoping that they GET ON THE BALL, and continue to do SuperAntiSpyware, and I will add MBAM, again, in the layered approach? In the course of my sojourn here you have always been most helpful and it so greatly appreciated. AVG’s updates are now quite small – just ran an update test (as I’m writing this) – only 3.2kb. So, allowing auto updating rather than manually updating once a day (bigger files), it’s probable that you won’t see updates much bigger than this. You’re an experienced and cautious user and that matters – BIG TIME! Give you an example why this is important – one of my machines has been online 24/7 for over 4 years now – with NO protection. It’s never been infected – it’s the person at the keyboard that counts. You might be surprised just how many techs use little, or no protection. I actually thought Microsoft was getting it’s act together with MSE as far understanding that if your going to put out an antivirus\antimalware program, it better be good protection. I have not run MSE for awhile now so I am glad to read your article and get updated on how good it’s protection really is, otherwise I might be still recommending it to other people. I know in the past a lot of people have recommended AVG to me but after trying it, I was not very happy with it for the exact same reasons you mentioned. I am currently using the paid version of Webroot Secure Anywhere Complete along with other layered programs but I will have to give AVG a second chance on your recommendation on the other computer. I have no doubt that MS will respond to this poor test showing with the usual – but in real world conditions…….! I’m willing to listen. Cool – take this one for a drive and, if have the time maybe you could shoot me a note on your experience with it. Actually, I can scan this complete system – 3 drives (about 300 GB) in under 30 minutes. MalwareBytes (free edition), using the full complement of available MB resources, completes the same task in about the same time. The results you mention are waaaay outside the norm – assuming of course the data being scanned is relative to the size I’ve mentioned above. Driver conflict cannot be overlooked as a primary cause of the condition you describe. As a test, you might try an install of MalwareBytes (free edition) so that you can get a baseline to work with. You think just like me. Today, the fridge wouldn’t keep the beer cold – so, I went out and bought a new fridge. Your article has got me thinking that I might switch to AVG once more. I haven’t used it for a few years! Sound like it’s now a better product than it used to be. Just out of interest I searched the AV-Test.org site to see if a newly released AV was mentioned or tested anywhere on the site. Sadly I couldn’t find it. It’s called “Unthreat” and seems to have some good reviews. Personally, I tried it and had problems getting it to scan my email so removed it after running a quick scan of my system! Sounds as if you and I had our “gotta get rid of this beast” (AVG) moments back in the day. 🙂 This new version is definitely worth a try – seems it’s been rebuilt from the ground floor and up. Hadn’t heard of “Unthreat” – but, I’ve just thrown it on my “let’s take a look list.” Thanks for that. Bill. I started with MSE also, but it has went down hill terribly. On my machine, CPU spikes are unreal, slows my system to a crawl. I really do not think there development department gives a poop anymore. It was really good at one time, but not now. AVG is great, I am using Panda for now, no problems. Thanks for sharing. Regards, Dave. Your point “I really do not think there development department gives a poop” is well made. It certainly appears as if the focus has changed – not for the better. Panda makes a great app – really like the community “cloud” aspect. I’ve made the point, on more than one occasion over the years (in truth, scores of times), that there is an over reliance on AV test results (in some quarters) – just as you pointed out. And, for the reasons that you pointed out. My comment (partial) on another tech site – July 2012. “As someone who watches a broad swath of independent testing laboratories, I can assure you – the results of these test go up and down like a toilet seat – often in less than 3 months. It’s important for users to understand that testing captures perceived performance as a “snapshot in time” – nothing more. A simple read of any security application market penetration report will show, not a single security application vendor has yet captured a significant share of the market despite (or, perhaps because of), overblown effectiveness claims. It seems that users just don’t buy the BS. Finally, the question is essentially redundant – the majority of malware makes its way onto a system by invitation. There isn’t a security product on the market which will override the lack of common sense. Ask any one of the hundreds of enterprises who have been penetrated (caused by careless employees), just in the last few months – enterprises which have installed security solutions that rival science fiction. In the end, a pointless endeavor, since no consideration was given to employee education. Perhaps more to the point is the following article – September 16, 2011 – Antimalware Application Reviews – Who Can You Trust? I think that you’ll find that this is not an issue I avoid. As I said in a comment response earlier today – I have no doubt that MS will respond to this poor test showing with the usual – but in real world conditions…….! I’m willing to listen. In fact they did – I had access to that response earlier today. And, I’m still listening. Over the years, I’ve had many opportunities to engage in conversation with testing labs – centered in Universities, private for fee application testing labs, etc. So, I’m not unfamiliar with testing methodology. Do I trust the methodology without reference to common sense? No. Even an uninterested observer would agree, that the computer security sector is prone to exaggeration, hyperbole, overstatement ….. and, in some cases, a certain sense of distortion. What I find disturbing about this latest MSE slide is – the “snapshot in time” has shown no improvement – in fact, the reverse. So, at a personal level I’ve made the decision to move on from MSE. I value your opinion – especially given your background and experience. So, thank you for joining in the conversation. As you’ve highlighted, one score is never enough (‘one swallow does not make a spring’ – is that right?) – the more reviews, tests, etc help to keep someone informed. From there? It’s down to trust – if you trust the product to do the job and it has decent reviews then you’ll probably not go far wrong. In fact, the danger from there comes from zero-day exploits (Java in the browser anyone?) and silly users clicking on dodgy links…! Yep, it’s the person behind the keyboard – that’s what makes the difference. Looking at the AV Test page, I’m a bit shocked at MSE’s rating. It is very poor. I don’t think I am going to go with AVG though. I have had bad experiences in the past with it. I like your review of it, but I think I might go back to Avira. I’m going to wait a week to do this though. Next week my brand new spanking machine will be on my desk. I guess in this case I will be breaking up with XP lol. Windows 8 it will be (or maybe 7, haven’t tried that yet either. WIn 7/Win 8 – you’ll love either one. Since you’ll face a bit of a learning curve with either one, you might be better (in the long run), to go with 8. That’s the future. Better security overall is also a prime consideration. Always liked Avira – still use their Rescue Disc (as do you, I know) often. MSE will be back – I have no doubts at all. These tests are difficult to gauge. How valid are the tests? I think that depends on who you ask. I doubt many people really understand the results or the parameters used. In other words, it’s not valid to test how well a fish can climb a tree, or how well a canary can swim. Yep – read the MS response earlier. The only comment I have at this point is – the potential to infect is most significant. Not (at least in my view), the malware (samples or otherwise), that MSE users (according to MS), encountered. Using that type of logic, it seems to me that a preemptive flu shot is a pointless endeavor. The reality is – we know it’s not, since it guards against the potential of infection. In the end, as pros, we’re each driven to make choices based on our backgrounds and personal experience. It shouldn’t be otherwise, I don’t think. Good to get your input on this. I should also say that the last time I tried using AVG, I was surprised to learn that the format of my emails were altered. HTML was rendered very differently by the time it had gone through their servers. I really didn’t care for that at all. I’ll stick with MSE. Paul Thurrott’s opinion (and yes, I read it this morning), is not as important to me, as my own. Is my 35 years plus experience in IT, less important to me than his more limited experience? The answer is self-evident – I think not. Thurrott’s piece is, as many of his pieces are, simply a rehash of Microsoft’s position on this issue. A common enough occurrence in his columns. On top of which, Thurrott has long been noted as an unofficial Microsoft spokesman – some say a paid spokesman. So, not exactly an unbiased opinion. And, as for his assertion as to “facts” – funny, I was under the impression that the recent AV testing brought these “facts” into question. Isn’t that the debate? Just a point: AVG downloads last week on CNET alone – 988,636. Total downloads are now approaching half a BILLION. Of course they could all be wrong and would be better served by using MSE, despite the questions now surrounding its efficacy. You’re more than entitled to your opinion – agree or disagree – but, I think you’ve managed to state it. I thank you for that. I suggest that you read my response to Jim Hillier. All good points in your response to Jim. Thanks Bill. Another thing people need to understand is that a virus scanner is more like a seat belt than a bullet-proof shield. In an accident, you hope the seat belt will help, but it’s no guarantee. There’s no substitute for best practices and understanding. Easier said than done, I know, but people will jump onto the information highway without ever taking a driver’s test, and they are going to be at risk. A virus scanner might help them, but chances are, they are going to eventually crash. On the other hand, someone with good sense and understanding can likely function without a virus scanner (though I wouldn’t recommend it). The point is, the scanner can only do so much, and for some it’s really a false sense of security. 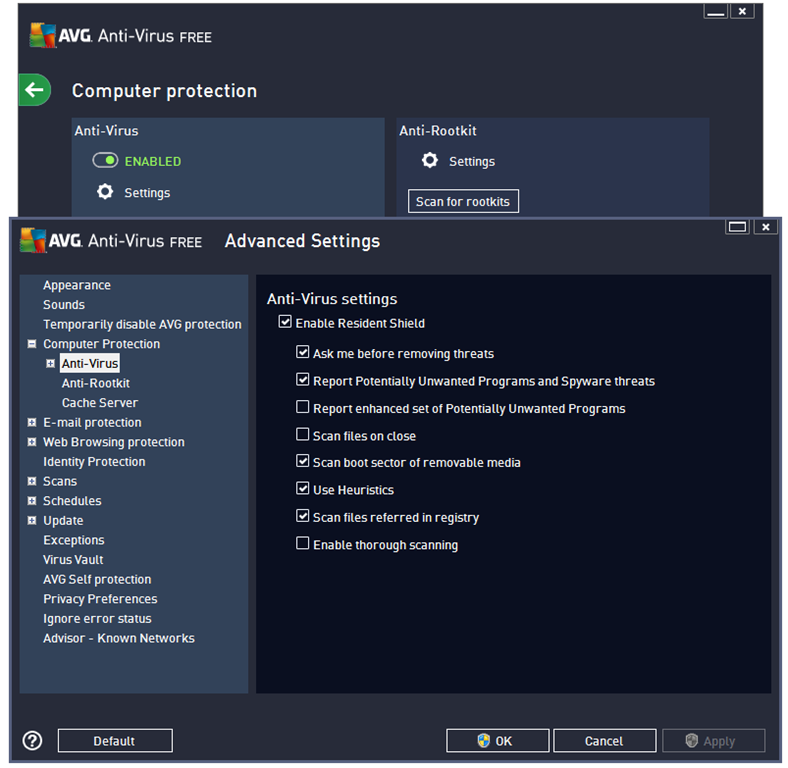 keep running Malwarebytes Anti-malware or AVG as a backup occasionally. Thanks for the heads up on SARDU – downloaded and installed. Took a quick look – definitely worth an article. when it finished I was clean. My son learned a valuable lesson in the process. Note this laptop had an SSD(256gb) for C: which was infected and D:(300gb)drive for data that was ok.
A great example of why running with 2 drives can be a lifesaver. Personally – wouldn’t run a machine without at least 2 drives. Looking forward to going the full distance with SARDU. Hopefully, early in the week. I’m grateful for the update on AVG. It was my first free AV many years ago. I’m glad to hear they’re back on track as an effective, free, and light weight AV. Hopefully Security Essentials at least uninstalls easily, unlike some AV’s I could name. I don’t take much stock in a lot of AV tests, but I do in your opinion, it’s always reasoned and well thought out. AVG 2013 is a vastly superior product to previous editions – not hard to do, given some of the history we’re both familiar with. Incidentally, you won’t have an issue with an MSE uninstall. What did you use to remove MSE? AppRemover or I do have paid uninstaller..Your Uninstaller? Actually, I had just finished a reformat/reinstall – so, no uninstall. AppRemover, or Advanced Uninstaller Pro (free) should do the trick.